We love the Joseph Joseph range and the bred bin caught our eye due to its simplistic style and solid build. The Joseph Joseph bread bin itself is made from stainless steel which you can see on the outside, while the interior of the bin itself is a dark grey. 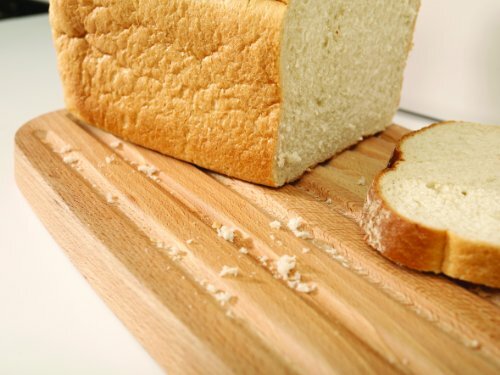 The lid to bread bin is a solid block of wood with a seamless handle to the top of it which is carved down into the wood allowing you to grip it. With the lid removed it then doubles up as a chopping board, with he had on one side, once flipped over there is the chopping board which has grooves carved out to allow for breadcrumbs to drop into and makes for easy clearing up. When it comes to design and style it looks great, the dark inside and airtight container with the solid lid helps keep your bread fresh. So while its form and function is unquestionable the one drawback is the price, at around £75 it is expensive for what it is. This kitchen bread bin is’t going to change your life, but if you want a stylish bread bin and love the Joseph Joseph range, than although pricey you can’t fault this Joseph Joseph bread bin.